The ethos of any good event, whether it’s a wedding or a fundraiser or a party, is to create a memorable occasion, something that takes up residence as a fond memory in the minds of all those who attend. In Sonoma County, we witness many dazzling and spectacular weddings, so when something really special comes along that is NOT a wedding, it bring us that little bit of extra joy! The occasion: A 60th birthday party. 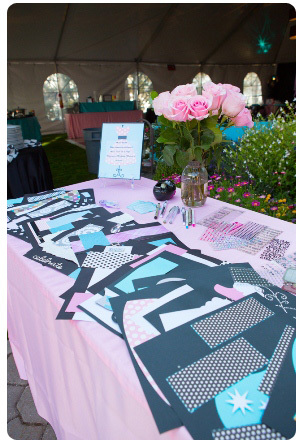 In the food tent, we went with a vibrant 50’s color scheme: pink, black and teal. 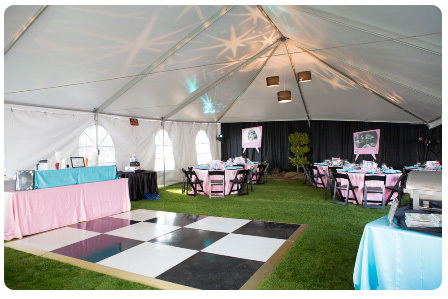 The “jump and jive” theme of the 50’s was enhanced even more when we added a black and white checkered dance floor. Pineapple Planet created customized chandeliers with a classic poodle skirt. 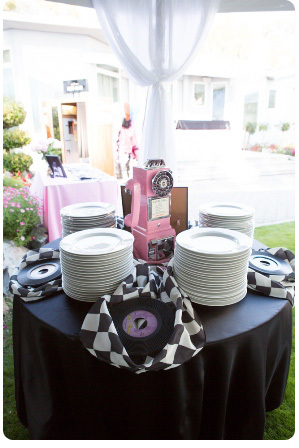 All of the food stations matched the theme in color and style and we even themed each buffet with a 50’s décor. 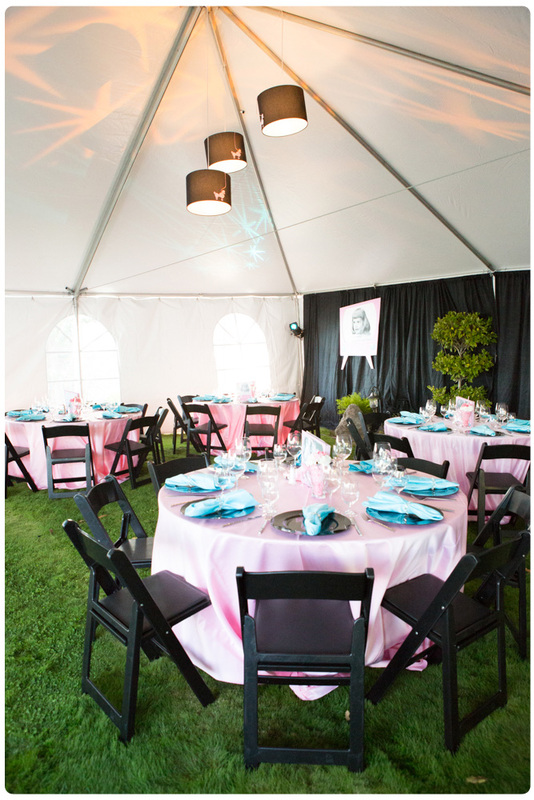 For the all-important linens, we went with pink and accented this vibrant color with black chairs and chargers. 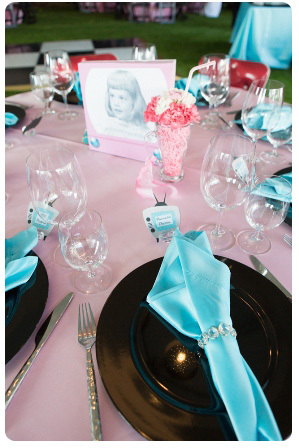 The color palette was completed with the addition of teal napkins. Our contact for the 50’s style birthday party and Donna from Pineapple Planet came up with the some great 50’s inspired centerpieces. 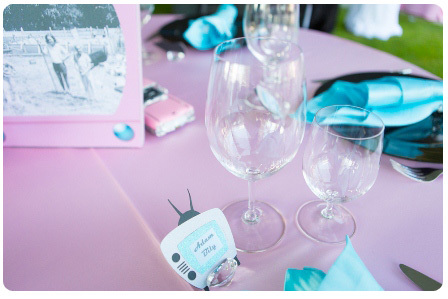 Miniature pink Cadillacs, sundae cups and even handmade name tags designed to look like the chunky, valve-powered TVs of old! Too cute. The dessert for this great occasion was a custom cake that complimented the color palette and came complete with 50’s paraphernalia! For the birthday girl’s keepsake, each guest took pictures in an old-fashioned photo booth and compiled a scrapbook album with pages from each of the guests. 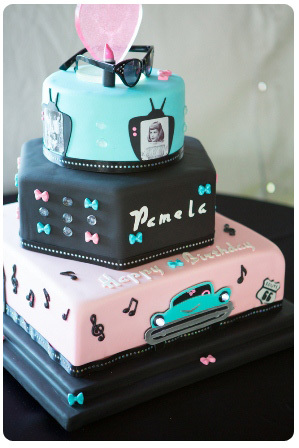 This 50’s style birthday party was a huge success. Great food, amazing décor, lighting, a photo booth, a jukebox and a swinging 50’s style band. All of the guests had an amazing and memorable time. We couldn’t have pulled this event off without our friends from Ray’s Catering and Donna and Scott from Pineapple Planet.